Kauai celebrates the 10th anniversary of its Festival of Lights at the Historic County Building beginning Friday. More than 5,000 people are expected to attend the opening event, beginning at 6 p.m. with caroling by the Kauai Chorale and followed by Santa's arrival and a lighting countdown. After the countdown, doors will open for a view of the interior's illuminated decorations while listening to the Kapaa Middle School 8th Grade Choir. The evening's finale will be the Lights on Rice Parade, with a showcase of lighted floats, at 6:30 p.m. This year's theme is "Santa's Gone Kauaian," with Santa and Mrs. Claus waiting for keiki to visit their magical Fern Grotto, surrounded by island flora. Miniature Hawaiian hale and the Na Pali Train Village will be surrounded by Kauai treasures such as shave ice, rainbows, roosters and dolphins. The most anticipated decorations are those created by Auntie Josie Chanksky, a folk artist born and raised on Kauai. Her home is known as "The Christmas House" because of her tradition of opening her home to neighbors and visitors to view wreaths formed from egg cartons and a Christmas tree made of 7,500 green toothpicks. 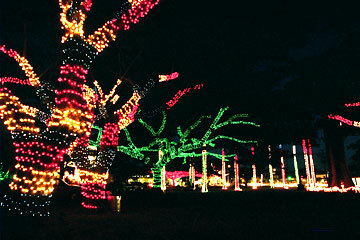 The Kauai Festival of Lights, recently recognized by MasterCard's Priceless.com as one of its "Priceless Picks," based on the company's TV ad campaign, will be open from 6 to 8 p.m. Fridays to Sundays through Christmas Eve. For more information, call 808-828-0014. Kauai will light up its buildings for the holiday season Friday. Master artisan Umi Kai will demonstrate the making of mea kaua (Hawaiian weaponry) and makau (Hawaiian fishhooks) during a free hour-long cultural presentation at the Outrigger Reef Hotel on Dec. 6. The demonstration will start at 9 a.m. as an opportunity for guests and the community to learn about the making of traditional Hawaiian implements. Like the fishing implements, weapons were varied and included barbed and un-barbed spears, clubs, slings and straight or curved-blade daggers. Kai is one of Hawaii's few crafters of Hawaiian weapons and a member of a Hawaiian martial arts group, Pa Ku'i-a-Lua, that is trying to revive Hawaiian fighting arts. He has been honored by the State Foundation on Culture & the Arts. In the spirit of the holidays, members of Marriott Rewards, Marriott International, Inc.'s loyalty program, can donate Marriott Rewards points they have accumulated to the charity of their choice anywhere in the world. Members will be able to redeem points for "Marriott Cheques" that can be used by charitable organizations for a variety of purposes, including hotel stays, food and beverage, and fundraising. Members can also redeem points for donations of dining certificates. Rewarding communities is one of three philanthropic giving options offered by Marriott Rewards to its members. For seven years, members have been able to donate points to Children's Miracle Network, allowing families to stay at hotels close to their children who are receiving treatment at children's hospitals across the U.S. and Canada. Marriott Rewards members have donated more than 30 million points since the program began in 1999. Last year after Hurricane Katrina, Marriott Rewards teamed up with the American Red Cross to assist in providing temporary shelter and food for those displaced from their homes during disasters. Marriott International's portfolio of resort hotels in Hawaii includes the Waikiki Beach Marriott Resort & Spa, JW Marriott Ihilani Resort & Spa, Kauai Marriott Resort & Beach Club, Waikoloa Beach Marriott Resort & Spa, Wailea Beach Marriott Resort & Spa and Renaissance Wailea Beach Resort. To learn more, visit www.marriott.com.